Both Yamaha M1’s will be using the seamless shift gearbox this weekend. In today’s pre race press conference Jorge Lorenzo and Lin Jarvis revealed that the long awaited seamless shift gearbox will be fitted to both Jorge Lorenzo and Valentino Rossi’s Yamaha M1’s this weekend in Misano. Yamaha have been developing the new gearbox ever since HRC introduced theirs to MotoGP over two years ago. Yamaha have been testing non stop, including extensively at the private test in Brno during the summer break to ensure they don’t get left behind by Honda. “It [the seamless] will be here tomorrow. We can say that,” declared Lorenzo on Thursday. There was even better news for Yamaha as the new gearbox fits the existing crankcases, meaning Yamaha don’t only have one engine to play with with the new gearboxes. 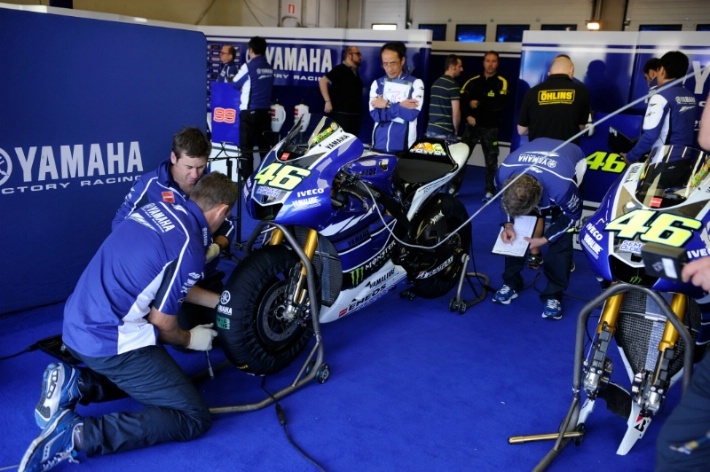 “The gearbox is completely new for us, a Yamaha designed system, and we thought some improvements were needed [after the Brno test] before using it in a race,” said Lin Jarvis, managing director of Yamaha Racing. “You always take some risk, but we wanted to perfect it more until now. Jarvis also confirmed that Yamaha had been somewhat drawn into a development, and spent far more much money than they have hoped to have, due to Honda’s spending and rate of development. “If Honda hadn’t invested a huge amount of money to develop seamless, we wouldn’t have invested a huge amount of money to do it. But that is the nature of competition. You have to react. If we want to compete and win, in some cases we have to respond to our competitors, but we are always looking to advance technology.